I've read many times, that the onset of large climate changes is governed by changes in insolation of various latitudes on the Earth due to changes in the geometry of Earth movement (Milanković theory, see www.mpae.gwdg.de/EGS/egs_info/milankovic.htm). I also remember an old misunderstanding, that as the Holocene is here for ten thousand years already, it should end soon, as the last interglacial (and also previous warm periods) did not last as long. However, if the driving factor is a change of insolation, we are not limited to guessing that the present post-glacial period will be similar to the previous ones, but we can rely on astronomical ephemerides of future insolation. They say clearly, that the present warm period is to last at least as long as the past cold period! This holds for sure even with no anthropogenic enhancement of the greenhouse effect. For the future one hundred thousand years the Earth orbit will be almost circular, and therefore no very cold summers can appear in northern latitudes. Cold summer millennia occur just then, when the Earth goes through apohelion (farthest point of its orbit from the Sun) during the northern warmest months, and when this apohelion is far indeed. The latter condition is true only in times, when the orbital eccentricity is large. It will be large only half a million years later, so there is no danger of a glaciation before that. 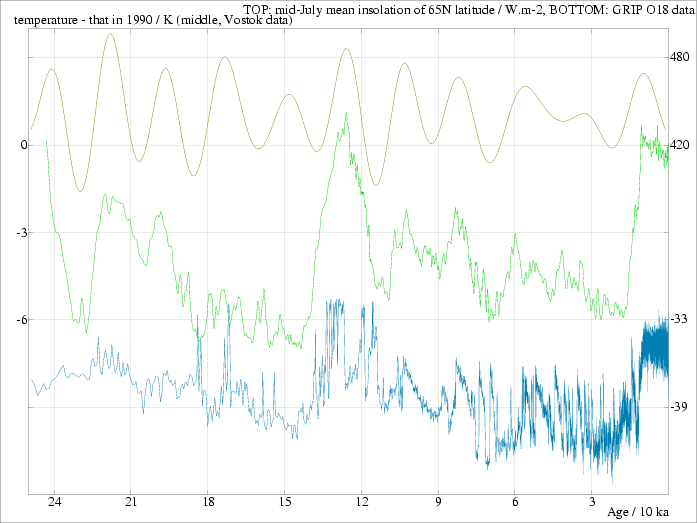 Now, let's visualise the correspondence between insolation and global temperatures. To do that, data from http://www.ngdc.noaa.gov/paleo are needed. The above picture made from them displays three curves. The top one gives the average insolation of 65 degrees northern latitude (Watts per one square meter of a horizontal atmosphere) in mid-July. As seen, it varies from some 390 to 490 W/m2 (the data are taken from ). The middle curve represents well the global temperatures. More accurately, it partly neglects northern hemisphere, as the data are from the Antarctic Vostok ice core . The bottom curve is from Greenland GRIP core; not the temperatures themselves are given, but just relative abundances of an O18 isotope. These are indicators of the ruling temperatures in the northern Atlantic. It is apparent that many abrupt changes appeared there, almost surely caused by different states of warm northward Atlantic conveyor belt. However, a smoothed curve would be quite similar to the middle one, i.e., the long-period temperature changes are really global. The correspondence of insolation of northern latitudes and global temperatures is striking. How is that possible? The answer is in trends of glaciation. Warm northern summers tend to diminish the ice sheet, whereas during cold ones (and warm winters with more precipitation) the permanent snow cover grows. This affects not only the Earth albedo, but somehow also the methane concentration in the atmosphere - much methane is contained in hydrates in permafrost and sea bottom in northern latitudes, and warming can release much methane into the air. 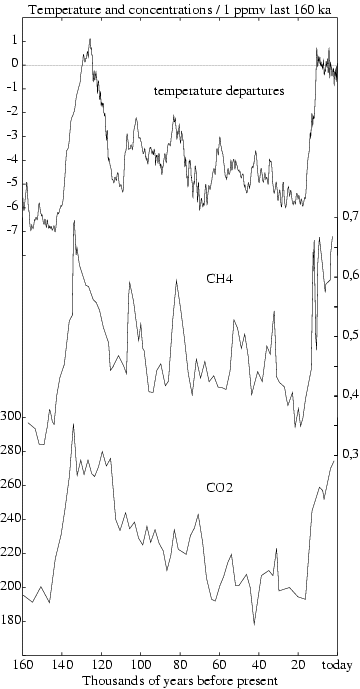 The large global temperature changes are just triggered by changing insolation, their large amplitude is however possible just through a large change in greenhouse gases concentration, as figure 2 shows. The methane data are from , CO2 ones from . Now, the future. To get the insolation of the northern 65 degrees parallel, I have employed the programme insola from . The result is in the following figure. You may note, that the values for the past 260 thousand years are a bit higher than in the first figure. This is mostly due to a different part of summer for which the data hold (and to a different ``solar constant'', I took 1366.3 W/m2). The main result is, that the mid-summer insolation of relevant northern latitudes will be not as low as at the onset of the last glaciation (110 ka before) another 0.6 Ma. The first ever pronounced fall of summer insolation happens some 130 thousands years from now, but it is not at all so deep as those ones that started the last two Ice Ages. So, we can say there is no conceivable cause for another glaciation for at least those 130 ka. Quite probably, another glaciation cannot come sooner that 620 thousand years from now. To be worried that ice sheets will spread soon is really a queer attitude. We should be more concerned with the possibility of a runoff greenhouse effect which could turn our Earth to another Venus before that half-a-million years! Berger, A., 1992, Orbital Variations and Insolation Database. IGBP PAGES/World Data Center-A for Paleoclimatology Data Contribution Series # 92-007. NOAA/NGDC Paleoclimatology Program, Boulder CO, USA. See ftp://ftp.ngdc.noaa.gov/paleo/insolation, file orbit91. Johnsen, S.J., H.B. Clausen, W. Dansgaard, N.S. Gundestrup, C.U. Hammer, U. Andersen, K.K. Andersen, C.S. Hvidberg, D. Dahl-Jensen, J.P. Steffensen, H. Shoji, A.E. Sveinbjörnsdóttir, J.W.C. White, J. Jouzel, and D. Fisher. 1997. The d18O record along the Greenland Ice Core Pproject deep ice core and the problem of possible Eemian climatic instability. Journal of Geophysical Research 102:26397-26410.